with material from AMM, Better Books, Bob Cobbing, DIAS, Coleridge Goode, Joe Harriott, James Joyce, Jeff Keen, John Latham, Annea Lockwood, Gustav Metzger, John Stevens, Val Wilmer and more. 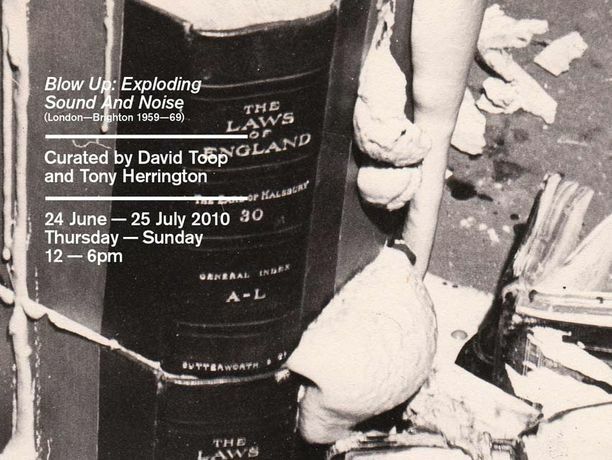 A new exhibition of artworks, archive, movies and sound curated by Tony Herrington (Editor-in-Chief & Publisher, The Wire) and David Toop (musician, curator, long-time collaborator of John Latham). For a period in the 1960s there was a great creative synergy in the UK between the visual arts, experimental film, free jazz, psychedelic rock, and the energetic poetry scene that formed the UK's so-called Underground. BLOW UP will present a visual and aural map of those connections through art works, recordings, archival film and documents, contemporary accounts, posters and album art.